2NE1 is the first girl group of YG Entertainment and considered as one of the legendary Kpop groups due to their girl crush and rebellious concepts and songs, such as ‘I’m The Best’, ‘Ugly’, and ‘Come Back Home’. One of important aspects that people admire from 2NE1 is their daring choice in fashion as they are not afraid to mix bold colors into one style. 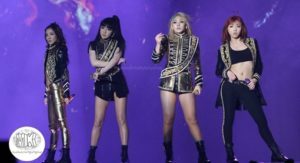 Thus, in this post Channel-Korea compiles all about 2NE1 and their fashion, starting from the outfits when 2NE1 perform their songs in the stage, 2NE1 outfits when they promoted ‘Ugly’, 2NE1 wardrobe when they promoted ‘Crush’, 2NE1 outfits when they sing ‘Come Back Home’, brands of clothes which 2NE1 members wear, and 2NE1 members personal style that you can apply to your own fashion style. Stay tuned! In the first picture, we can see that two 2NE1 members Sandara and CL wear pink outfits despite being in the different shade and kind as Sandara wears a long baby pink shirt and chain necklace whereas CL wears a sleeveless dress which covered the white dress with purple lips pattern and big blue necklace. As the lower part, Sandara wears a white short skirt with blue polkadot pattern. The main vocalist of 2NE1 Park Bom wears a white dress with colorful rectangle as its pattern and bracelet o her left wrist, meanwhile Minzy wears a black tank top, yellow cardigan, chain necklace with a big round pendant, and grey flowery pants as her outfit. The color of white, black, purple, blue and pink dominate 2NE1 color scheme for their outfits. Sandara wears a sleeveless black and white shirt with pink and blue thunder print out and baggy jeans, whereas Bom wears a mini dress with black, white, blue and purple animal print out and black necklace. On the other hand, CL wears a pink jacket with silver and black color on its sleeves, ripped grey denim pants, and black gloves, meanwhile Minzy wears a white shirt with pink, black and orange animal print as its pattern and black pants with cartoon pattern. The zig zag and horizontal pattern become the main theme for 2NE1 outfits. Bom wears a green tosca mini dress with dark blue zig zag and horizontal as its pattern, black sneakers, and white round necklace, meanwhile Sandara wears a white dress with black zig zag pattern, big red and white heart earrings, and white sneakers. On the other hand, CL wears a salmon dress with pink horizontal pattern, blue earrings, orange necklace, rings on her index finger, and white sneakers, whereas Minzy wears a white sleeveless shirt with silver ruffles on its neck and below, black tight pants, silver bracelet, and black sneakers. The color of black and white along with vibrant colors dominate 2NE1 stage outfits. Sandara wears a ­­­long pink shirt with cartoon pattern, black and white skirt, and white sneakers, meanwhile Bom wears a yellow sleeveless overall shirt with black and white cartoon and horizontal pattern and white sneakers. On the other hand, Minzy wears a black fishnet tanktop which is combined with yellow outerwear, green tosca and black leopard print pants, and white sneakers, whereas CL wears an orange dress with yellow cross and blue and white horizontal pattern and black sneakers. 2NE1 looks classy by wearing representative color for each of them. Minzy wears a black shirt which is combined with red loose jacket with black animal print, black tight pants with chain detail, and black high heels, whereas Bom wears a black mini dress which is combined with blue checkered cardigan, black and white shawl, grey leggings, and black high heels. On the other hand, CL wears a black and white flowery dress which is combined with black and red checkered outerwear, leggings, and black high heels, meanwhile Sandara wears a white and pink flowery dress which is combined with baby blue outerwear with black star pattern and black high heels. 2NE1 is red and black ladies as their outfits are dominated by these colors, such as Bom who wears a mini dress, Minzy who wears shirt, coat, and pants, CL who wears a army-like suits and tight pants, and Sandara who wears a mini dress, cardigan, and leggings. As the accessory, all members of 2NE1 wear a big gold crown on their head. Bom wears a long black and orange shirt with black short pants and big silver earrings, whereas Minzy wears a black sweatshirt and dark blue with mozaic pattern leggings, black watch on her left wrist, and grey sneakers. On the other hand, CL wears a black oversize shirt with black short pants, pale gold necklace, and brown sneakers, meanwhile Sandara wears a black short turtleneck and mini skirt with silver star pattern, black and white biker jacket, and black flat shoes. In this occasion, 2NE1 members wear black and white suits with variations of accessories and hairstyle. Don’t you agree that they look as cool as ever? Minzy wears a black inner shirt with ruffles on its neck which is combined with yellow and black checkered blazer and black denim pants, whereas Bom is like a doll by wearing a long silver mini dress with black ribbon on its neck, black and yellow headdress, and black platform shoes. On the other hand, CL wears a white inner shirt which is combined with red blazer. CL also wears pants, gloves, shawl, and fedora hat which color are black. 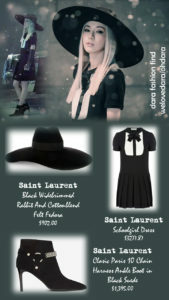 Lastly, Sandara wears a black and white dress which is covered with fur coat with in the same color and blue fedora hat on her head. 2NE1 looks sporty and chic as Sandara wears a black loose shirt, short pants, and necklace, whereas Minzy and Bom wear identical baby blue jerseys and different black platform shoes. Lastly, CL wears a black bomber shirt, black pants, silver bracelets on both of her wrists, and black high heels with tight socks. 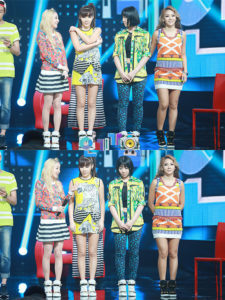 2NE1 is colorful girls as they wear various kinds of wardrobe and color. CL wears a pair of rainbow crop top with long sleeves and short pants, and brown round necklace, meanwhile Minzy wears a black loose shirt with yellow cartoon print out, pink cardigan, and black and white short pants. On the other hand, Bom wears a white mini dress with colorful print out and Dara wears a colorful crop tank top and red skirt. 2NE1 looks innocent as they wear white outfits. CL wears a crop top, tight pants, and fur coat with black stripes as its pattern, whereas Bom wears a mini dress and dangling earrings. On the other hand, Sandara wears a black and white shirt with leopard print out as its pattern which is combined with jacket with black polkadot pattern, skirt, and black fedora hat, meanwhile Minzy wears a long sleeve dress and tight pants. 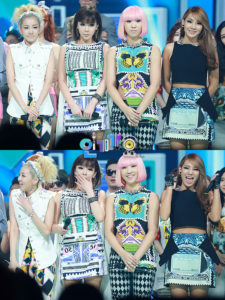 2NE1 outfits in this occasion are dominated with tribal pattern. Sandara wears a white vest, long pants with tribal pattern, white headband, white round bracellet on her left wrist, and earrings, whereas Bom wears a white mini dress with tribal pattern and black silver bracelet on her left wrist. On the other hand, Minzy who has pink short hair wears a sleeveless shirt with butterfly and plant pattern and green tosca pants with black diamond pattern, whereas CL wears a black crop top with white tribal skirt, chain necklace, and black gloves. 2NE1 wears several kinds of outfit when they promote ‘Ugly’. In the first picture, Sandara is draped in black as she wears a loose shirt, medium length pants, white socks, black and white sneakers, and headdress, whereas Bom looks more colorful by wearing a dress with ethnic pattern, black headdress, and black wedges. On the other hand, CL wears a black sleeveless shirt with cartoon print out, purple leggings, round earrings, studded choker, various kinds of bracelet on both of her wrists, and black and white sneakers, meanwhile Minzy wears a white shirt and jacket with cartoon print out, long black pants, black bracelet on her right wrist, and black and white sneakers. In the second picture, 2NE1 wears daring colors as Sandara wears a sleeveless turtleneck and black leather skirt, meanwhile Bom wears a black tanktop with fire pattern, and stockings. On the other hand, CL wears a red shirt and white skirt with black pattern, whereas Minzy wears a black tank top with smiley print out as its pattern, white biker jacket with Rolling Stones logo in its sleeves, and black tight pants. 2NE1 wears black suits when they perform ‘Ugly’ on music show. All the members wear different kinds of outfit which make them even more stand out in the crowd, right? 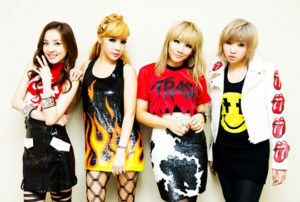 When promoting ‘Crush’, 2NE1 wears a set of clothes in various colors such as red, black and blue. CL wears a blazer with gold embroidery, black short pants, and black banner with gold embroidery, whereas Bom wears a sleeveless mini dress which is paired up with black mini pants and black banner with gold embroidery. On the other hand, Sandara wears a black shirt which is paired up with blazer with gold embroidery and gold pants, meanwhile Minzy wears a long sleeve dress with black tight pants and gold belt. For the blue outfit, CL has different outfit compare to the red and black ones as she wears a black bra and black short pants which are paired up with blazer and fishnet stocking all over her body. 2NE1 wears several outfits when they promoted ‘Come Back Home’. In the first picture above, Minzy wears a black shirt which is paired up with transparent coat with red fishnet as its pattern and black pants with white animal print, meanwhile CL wears a black off to shoulder shirt with long yellow animal print overall. On the other hand, Sandara wears a black sleeveless shirt with cartoon print out, black pants, chain necklace, silver bracelet on her left wrist, and black beanie, whereas Bom wears a black shirt, blackshort pants, and black and white bomber jacket. In this performance stage, 2NE1 looks futuristic as Bom wears a black shirt and short pants which are paired up with silver jacket, black platform shoes, and big round earrings, whereas CL wears a black shirt with cartoon print out and black pants which are paired up with a green tosca jacket with leopard pattern and gold round necklace. On the other hand, Minzy wears a black shirt which is combined with transparent coat with black fishnet as its pattern and chain necklace, meanwhile Sandara wears a black sleeveless shirt with cartoon print out, black and white pants, black platform shoes, and black and white fur hat. 2NE1 wears a set of red and white wardrobe for their performance and pair it with various kinds of accessory such as earrings, necklaces, and rings. Don’t you agree that they look revolutionary? In this occasion, Bom wears a black shirt with white cartoon print out and black short pants which are paired up with white jacket and platform shoesm whereas Minzy wears the whole black for her outfit, starting from her shirt, bomber jacket, tight pants, and platform shoes. On the other hand, CL wears a long white inner shirt and white short pants which are paired with a black leather vest and black wedges, meanwhile Sandara wears a black inner shirt which is combined with white vest, black leggings, black platform shoes, and black beanie. 2NE1 is well known for their outstanding fashion so it is not a wonder that they spend good amount of money on famous designer brands. The first picture above is Bom who wears red outfits which are consisted of coat and dress that apparently come from brand ‘VERSACE’. In the second picture, CL wears a black dress with gold detail and pairs it with black and red checkered jacket which both of those outfits come from brand ‘Saint Laurent’. As for the shoes, CL wears the black high heels from ‘Chanel’. In one of 2NE1’s music videos, Sandara wears a black dress, black fedora, and ankle boots which all of them come from brand ‘Saint Laurent’. Sandara wears a black jacket with silver stripes and button on both of its edges which comes from brand ‘Balmain’. As for the shoes, Sandara wears black wedges from ‘Giuseppe Zanotti’. On one performance with 2NE1, Bom is seen wearing a white and pink dress with ice cream pattern on it which apparently comes from the brand ‘Topshop’. On a press conference and waiting room, Bom is seen wearing a blue dress with butterfly print as its pattern which comes from the brand ‘Alexander McQueen’. 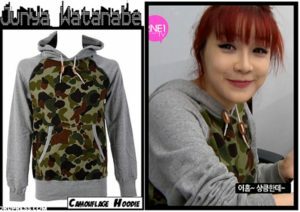 On 2NE1 ‘s reality show ‘2NE1 TV’, Bom wears a grey hoodie with army pattern which comes from the brand ‘Junya Watanabe’. 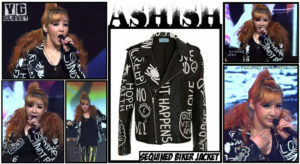 On one performance with 2NE1, Bom is seen wearing a black biker jacket with white written print put all over it which comes from the brand ‘Ashist’. On casual occasion, CL is seen wearing a pale brown shirt which comes from brand ‘Adidas’. 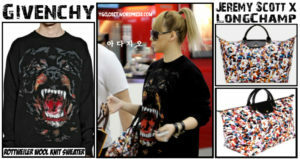 When she goes to the airport, CL is seen wearing a black sweater with dog print out which comes from brand ‘Givenchy’, whereas her colorful hand bag comes from fashion collaboration project ‘Jeremy Scott x LongChamp’. 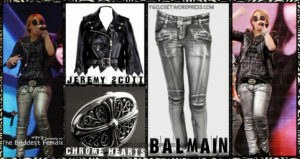 On a performance event, CL is seen wearing a black jacket which comes from her fashion designer friend Jeremy Scott whereas her belt comes from brand ‘Chrome Hearts’ and her silver pants comes from the brand ‘Balmain’. 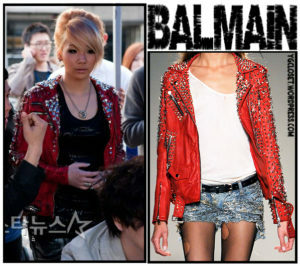 CL is seen wearing a red jacket with silver studded detail on its sleeves and edges which comes from the brand ‘Balmain’. CL goes casual by wearing a green pants from the brand ‘KTZ’, black and white sneakers from ‘Rick Owens’, blue beanie from ‘Piers Atkinson’, and white fishnet tank top from ‘Maison Martin Margiela’. On 2NE1’s MV ‘I’m The Best’, CL wears a black crop top which comes from 2011 Spring/Summer collection of fashion designer Jeremy Scott, whereas her earrings come from the fashion collaboration project ‘Casette Playa x AMBUSH’ and her mask comes from ‘Walter Van Beirendonck’. 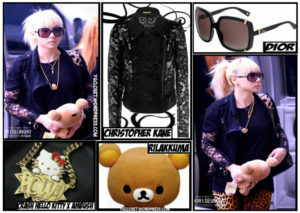 CL is seen wearing a black jacket with flowery print which comes from brand ‘Christopher Kane’, whereas her accessories such as sunglasses comes from brand ‘Dior’ and her Hello Kitty necklace comes from brand ‘AMBUSH’. On behind the scene of 2NE1 MV. 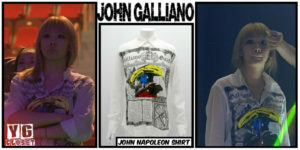 CL wears a long white shirt which comes from brand ‘John Galliano’. 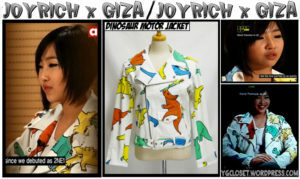 On 2NE1 TV, Minzy is seen wearing a white jacket with colorful animal prints which comes from the fashion collaboration project ‘Joyrich x Giza’. 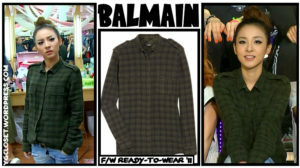 On one event, Bom is seen wearing a black dress which comes from brand ‘Balmain’. As for the shoes, Bom wears black high heels which come from brand ‘Giuseppe Zanotti’. On one event, Sandara is seen wearing a black fishnet inner wear from ‘Alexander Wang’, black biker jacket from brand ‘Balenciaga’, black denim pants from ‘Balmain’, and red shawl from ‘Balmain’. 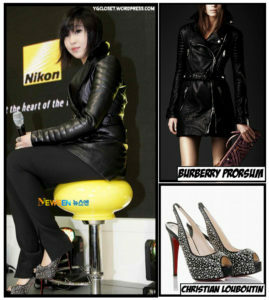 On one event, Minzy is seen wearing a black leather coat from ‘Burberry’ whereas her white polkadot high heels come from ‘Christian Louboutin’. Get to Know Miss Korea 2017 Seo Jae-won!